Swift currents, deep water and strong winds were the most obvious of the ‘insurmountable difficulties’ Strauss had to deal with. The cable contractor for the Golden Gate Bridge was John A. Roebling’s Sons Co. Trenton & Robeling, New Jersey. The Brooklyn Bridge in New York, completed 54 years earlier in 1883 and designed by wire rope patent holder John A. Roebling, was the first famous suspension bridge. The Brooklyn Bridge helped to define and add fame to New York City in much the same way that the Golden Gate Bridge has for San Francisco. The Golden Gate Bridge design echoes an Art Deco Theme. Wide, vertical ribbing on the horizontal tower bracing accents the sun’s light on the bridge. The towers that support the Golden Gate Bridge’s suspension cables are smaller at the top than at the base, emphasizing the tower height of 500 feet above the roadway. Irving Morrow—an architect hired by Strauss to design an architectural treatment for the bridge—chose the ‘international orange’ paint color to blend with the setting while still being very visible to ships. Coit Tower is another San Francisco landmark with an Art Deco design. Timothy Pflueger was probably the most prolific and renowned Art Deco Architect in the San Francisco Bay Area. Golden Gate refers to Golden Gate Strait—a name that originated around 1846. 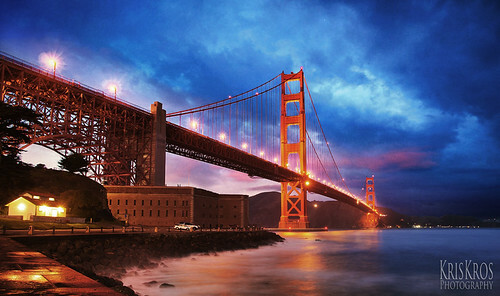 The Golden Gate Bridge’s 4,200 foot long main suspension span was a world record that stood for 27 years. It is still the second longest in the United States after the Verrazano-Narrows Bridge which links Staten Island to Brooklyn in New York. The bridge’s two towers rise 746 feet making them 191 feet taller than the Washington Monument. The five lane bridge crosses Golden Gate Strait which is about 400 feet, or 130 meters, deep. Simple yellow markers are used to switch the center lane so that there are three lanes into San Francisco for the morning commute and three leaving The City in the afternoon and evening. Golden Gate Bridge Tolls are only collected on the way in (going south). The toll on the Golden Gate Bridge increased to $5.00/4.00 FasTrak on September 1, 2002, later raised to $6.00/$5.00. Multi-axle vehicle rates (3 or more axels) will rise on July 1, 2012. There are no carpool lanes on the Golden Gate Bridge. Share your great photos with Kris Kros Contacts – One Per Day. ← Help, I’m Scared – I Just Read My Home Inspection Report – Is The House Falling Apart?